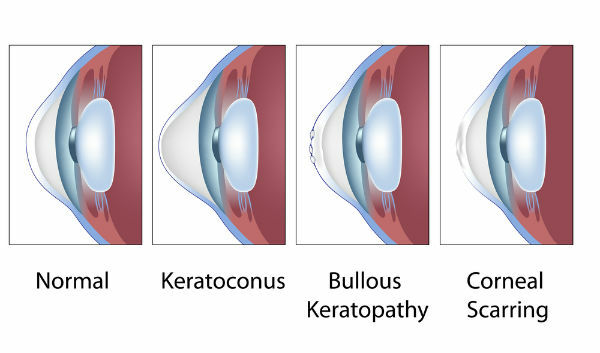 Keratoconus is a condition in which the normally round, dome shaped cornea develops into a cone shape. This condition is not common, but can occur in people at any age. The condition is most common in teenagers and young adults. It also tends to be hereditary in some families. It is not known why the condition occurs but eye rubbing has been an associated risk factor. In the early stages of keratoconus, glasses and soft contact lenses are commonly used to correct vision. If these don’t provide adequate correction, or if the disease progresses, there are other options including rigid permeable contact lenses, hybrid lenses, corneal transplantation, and in the future, corneal collagen crosslinking pending FDA approval. The eye doctors at Chester County Eye Care utilize the latest diagnostic equipment to evaluate keratoconus and follow its progression. All our optometrists are experienced with keratoconus specialty lenses and will work with you to find the lens that benefits you the most.